The Mermaid's Tale: How old is old, part II: 3465...and counting! How old is old? We asked this question on Monday when it came to relate to human evolution and our species' age and history as revealed by genetic data, in light of new estimates of the genetic mutation rate. Here, we're talking about differences of around 1 million or so years since we evolved from chimps, or much less since modern humans diverged from our barbarous colleagues like Neandertals. We see some modest changes in less than 10 million years, and debate whether it was 10 million or 'only' 7. But let's put that in perspective. A former college classmate of mine, Bill Schopf, at UCLA, has been one of the discoverers of the earliest of early life, the first fossils of life that are found on earth. These are bacterial colony constructs. Some are organized in compacted layers, known as stromatolites. 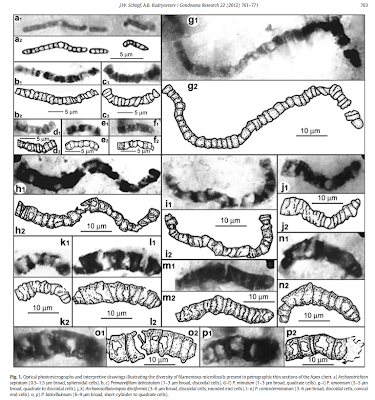 The structures resemble modern stromatolites, and they and other structures of fossil bacteria bear remarkable resemblance to today's bacteria and their biofilms, modern day versions of fossil stromatolites. How old are they? A mere 3465 Million, that is 3.465 billion years! A recent report by Schopf and Anatoliy Kudryatsev, in the journal Gondwana Research (Gondwana is the name for the earliest continent), reports on modern tests to show definitively that these fossils are real, as this as been the subject of some debate. 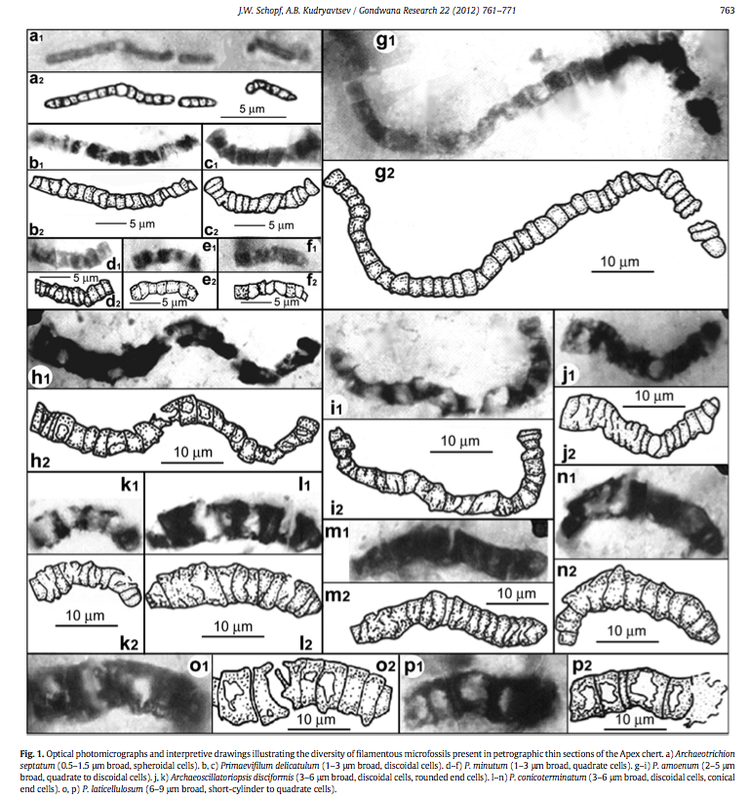 Here are images of these fossils and of their bacterial structures found from that report. After many years of various types of highly technical tests, the internal details as well as external shape and cellular structures now seem convincing that these are not natural mineral formations, but really are evidence of life. The earth itself is estimated to be 4.54 Bya. This means that from the first fireball, to life's first primordial 'soup' essentially to modern bacteria took only 1 Billion years. If bacteria and their aggregations were very primitive, or just barely making it as living organisms, then one might say that's about what we'd expect: a billion years to make the first staggering living things. But these are, in a reasonable sense of the word, already modern. One has to assume that their genomes would be very different from bacterial genomes today. If you look at genetic divergence among bacteria and other comparably primitive forms of life, you see that they are as different as you'd expect for such an old beginning....that is, they have diverged by an amount consistent with the 3+ billion year common ancestry. There is a touch of circularity in species split-time estimates because they are calibrated by fossil and other geological dating. But the picture is consistent. What this means is that the morphology, to a great extent, has been conserved for aeons of time, a rather remarkable fact, given that other descendants have diverged hugely, leading to plants, and us! How we can explain this level of conservation of structure, given the divergence of genomes, is a major but largely unrecognized challenge for evolutionary genetics. These findings make it seem trivial to ask how a few hundred million year old arthropods, like horseshoe crabs, or ancient but much more recent fossil insects or fish, can appear to be so highly conserved, if evolution is a relentless rat-race to adapt to a competitive and changing environment. The environments on earth are always changing, even if gradually and with some long-term stability. One can imagine that once adapted to an environment, it may be risky for a mutant organism to survive, if most mutations, occurring randomly with respect to function, are more likely to cause harm than to be beneficial. But since so much life is no longer bacterial and since there are so many kinds of bacteria, do we have a serious question to ask how any recognizable morphology of this nearly earliest of life could have persisted so long--when their descendant genomes as a whole, even among bacteria, have diverged in a reasonably molecular clock-like way? One would expect drift to occur in many, if not all traits: small, gradual changes that didn't harm fitness but that accumulated over billions of years to make the founding forms basically unrecognizable. Apparently this is not the case. Thinking about how to explain that is interesting--at least as interesting as accounting for Neandertal vs modern human variation and evolution.